We've all been there - in the restaurant wondering what on earth to choose. While everyone else chooses calorie-laden pizza or pasta, you go for a delicious low calorie salad... or so you thought! But do you really know what you're getting? Is the virtuous salad choice always the best one when you're trying to lose weight? What makes a salad the healthy option? As the weather warms up (maybe sometime soon?) salads become an attractive option both at home, and when we eat out. Most salad veggies are low in calories so filling up on these provides a healthy meal packed with important nutrients. With seasonal salad vegetables available in the shops now, making a healthy, delicious salad has never been easier. Liven up a boring bowl of lettuce with rocket, spinach, watercress or herbs, then add in traditional salad veggies like tomatoes, cucumber, celery or peppers, or maybe something more adventurous like artichokes, asparagus or red onion. Where we tend to go wrong with salads, is the 'other' stuff we put into them to make them taste good. Dressings are the biggest culprit. Just one tablespoon of a creamy Caesar Dressing can add a whopping 62 kcal and 6.6g of fat (and that's without the chicken, parmesan and croutons!). It's important to think about what you're adding to your salad and how that impacts on your overall calorie and fat intake. Don't just assume because you're having a salad you can eat as much as you like! Still weigh and record everything in the same way as any other meal - although most veggies are low in calories, no foods are 'free'. Restaurants are definitely getting better at offering lower calorie options and showing nutrition information on menus, but it's still not always as easy to make the healthy choice. We decided to do some detective work into the salads offered by four popular restaurant chains. Here are just a couple of options that surprised us. 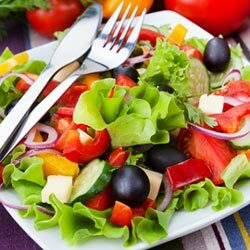 Choose the basic salad without these 3 items and it comes in at a very diet-friendly 394 kcals. Chicken and crispy pancetta salad with sweet Peppadew peppers, sweet baby onions, vine tomatoes, cucumber, peppers, basil and mint. Finished with extra virgin olive oil & red wine vinegar and shaved ricotta salata. With goat's cheese, dough sticks and dressing: 918 kcals. Losing the goat's cheese saves 140 kcals and makes the salad: 778 kcals. But even with no goat's cheese, this salad is HIGHER in cals than the Lasagna Classica: 700 kcals. Skipping the dressing saves 227 kcals and makes the salad a respectable 551 kcals. OR keep the dressing but lose the dough sticks (248 kcals) for a similar saving, making it only 530 kcals. If you are feeling very virtuous, lose both the dressing AND dough sticks (saves a huge 475 kcals) and the salad becomes just 303 kcals. Roasted butternut squash with goats' cheese, mint, courgette, lentils, green beans and salad leaves, tossed in a white balsamic dressing and served with dough sticks, With chicken: 871 kcal and 35.7g fat. Without chicken: 587 kcal and 23.8g fat. By comparison, Ravioli di Capra with 570 kcals has LESS than the salad! A delicious Risotto con Pollo E Funghi contains 622 kcals - LESS than a Caesar Salad! However - lose the dressing on the Caesar Salad and you'll save a massive 330 kcals - that's almost half the calories in the dish! At 396 kcals, the salad is much more diet-friendly - this is a great example of why it's always best to ask for dressings 'on the side'. Our apologies if we've trashed your preconceived ideas that salads are always the lowest cal choice! So where does that leave us? It's all about making informed choices. At Nutracheck we believe in 'knowledge is power'! As long as you understand the calorie content of what you are eating, you can factor it into your daily allowance. It's when you think you've made a good choice only to find out later that it wasn't so good that it's frustrating - hence the reason for this article! Although salads are generally a healthier option, remember that you need to think about what is in it and what extra toppings have been added, to assess whether it really is the lowest calorie option. Always ask for dressing to be served separately - that way you can add just a little. And if a restaurant offers nutritional information, ask to see it when you're choosing, or do your research online at Nutracheck.co.uk before you go, so you know in advance the best option to choose. Back at home of course it's much easier to control what goes into your meal. Instead of buying the same type of salad ingredients, why not experiment and mix it up? Here are some delicious but perhaps lesser used salad ingredients - why not give them a try? Beetroot, chicory, mange tout, butternut squash, radishes, baby corn, sweet peppers, watercress, wild rocket, kidney beans, adzuki beans, chickpeas, courgettes, olives, edamame beans, green beans, fresh herbs such as chives, dill or parsley... the list could go on! Dressings don't have to be calorie laden either. Try using one of these products for a healthier dressing without the guilt! Adding a squeeze of fresh lime, splash of balsamic vinegar, or sprinkle of chilli flakes are all ways to add a little 'zest' to your salad too.